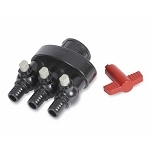 Triton 3-way diverter is the only manifold designed exclusively for pond-free fountain installations. The 1 1/2" inlet will not restrict the flow of water into the manifold, thereby delivering maximum volume to each of the three outlets. True 'ball' style valves with removable handles enable small flow adjustments to be made to each outlet independently. The compact design makes it a perfect fit for installation in all pump vaults and fountain basins. Dimensions: 4 1/2" x 5 3/8" x 2 7/8"